With that said, I have put together my top “do’s” and “don’ts” for playing games in class. 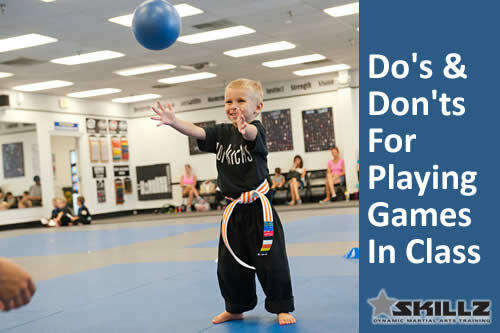 Do: Utilize games as skill-building drills. Ask any child development expert and they will all agree that people learn when they are having fun. It makes sense that your students will learn how to build valuable skills if they are having fun, such as playing a game. With that said, you can turn any game into a skill-building drill as long as the game shows measureable results in their skill development. Do: Use games to give the students goals to aim for. Games are a fun way to test and challenge a student’s talents. That’s why most video games have high scores that people try to aim for. Some drills are actually games and instructors don’t know it. Most children would enjoy the drill even more if they made it more like a game with a fun name and a challenge to aim for. For example, we have three “takeaways” for each drill which we want our students to focus on. Don’t: Forget to enforce the rules during the game. The problem with some games is the instructors forget to enforce the rules, and that leads to frustration and even chaos. Rule enforcement is important to keep things in order, and also to help the students build good teamwork and sportsmanship. With that said, even though games are supposed to be fun, they also need to have structure. Do: End every class with a FUN game! By the end of class, students get burnt-out. If you end class on a low-note then that can lead to boredom as they walk out the door, and they may not want to come back to class. If you end every class with a fun game, then they leave with a big smile on their face and that’s the last thing they remember. Another benefit to playing a game at the end of class is that you can use it as a reward for their hard work during class. Don’t: Act like you are better than the students and not play the end of class games with them! When the instructors play the game at the end of class with the students, it is a good way to bond with them. They get to know you on a different level, and this will lead to stronger relationships and more respect. Our students love when we play the games, especially when it involves hitting us with dodge balls or yoga balls! It is important to think outside the box. You may come across students that don’t like to play games, but that is a small few compared to those who do! You should notice an increase in student excitement and ultimately your retention if you incorporate the “do’s” and “don’ts” tips from this report! Thank you for this information! I do enjoy playing games at the end of class and sometimes in the middle to add a little surprise for the students. They dont even know that they are improving on their skills when we play!